The little courtyard that can be seen from our bedroom windows provides us with a visual feast. I was opening a window and saw, directly in front of me, a patch of shrubs with contrasting leaves of dark forest green and the light green of new growth. 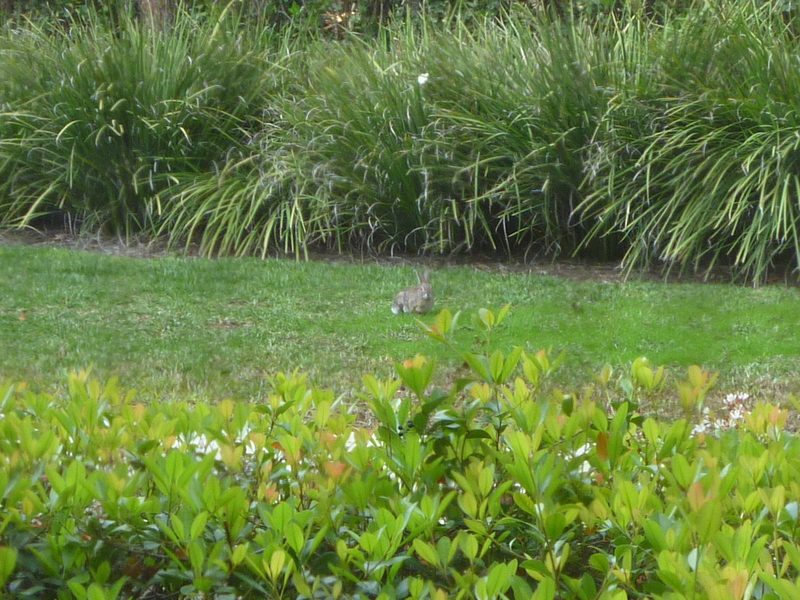 Beyond the shrubs, a cottontail rabbit was eating young grass. He stopped when he saw me, and then calmly continued eating. Looking out at this scene was delightful and entertaining. The cottontail kept on eating, moving from spot to spot. Then he began cleaning himself in a fastidious manner. First, he cleansed around his mouth and nose, then he moved up around his face and ended at his ears. When he was done, still facing me, he hunkered down and took a nap. Looking at the shrubbery again, I saw the dark green undergrowth and the bright green leaves reaching for the heavens from a different point of view. You and I both know that dark green is reflective of older, established growth in the leaves (also, the dark brown of the stems and branches). This established system supports and sustains the younger branches and leaves of new growth. I realized that our lives, rather, the generations of lives that span our existence, are much like these shrubs. We, who are older, are the undergrowth that undergird those who come after us. We, too, need a firm and nourishing foundation (Jesus Christ) in order to train up our children in the way they should go, and in the nurture and admonition of the Lord (Pro. 22:6, Eph. 6:4). I’m thankful for the Lord’s insights and the means He uses to show us the simple things. Blessings to you this day! This entry was posted in Christianity, Encouragement, Faith, Family. Bookmark the permalink. 4The guards were so afraid of him that they shook and became like dead men. ….5The angel said to the women Do not be afraid for I know that you are looking for Jesus who was crucified.